As Foxtel has lost its monopoly grip on the pay TV space, it has pivoted desperately to ward off competition from online streaming services, with only limited success. 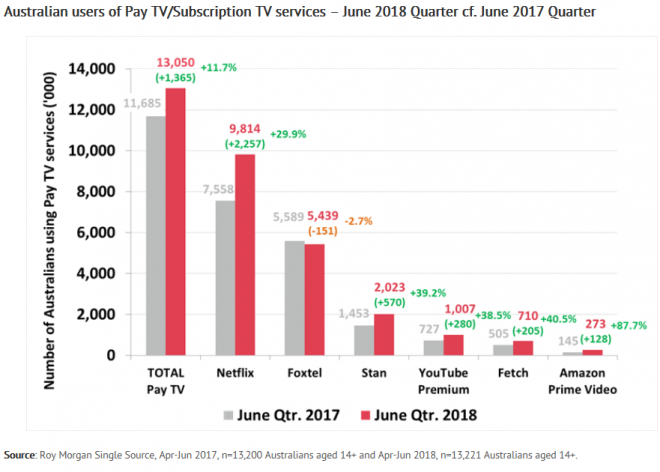 For example, prior to Netflix and Stan entering the market in early 2015, Foxtel halved the cost of its basic package as well as expanded content to its existing customer base. Foxtel also began offering no contracts and equipment-free packages from December 2016 in a bid to attract price-sensitive customers. This included monthly packages starting from $15, such as the “Pop” pack and the “Drama” pack. While it is good to see Foxtel competing harder for customers and offering a better deal for consumers, it is facing a losing battle against Netflix, which will continue to dominate the market and steal market share. First, Netflix recently passed Disney as the largest media company in the world. It has a global reach of around 124 million paid subscribers, very deep pockets, and a wide variety of first party content that is unavailable elsewhere and appeals to a wide variety of tastes. Second, Netflix’s cost base and price point is far lower. Unlike Foxtel, Netflix is unburdened by legacy hardware like set top boxes attached to traditional cable. This keeps its costs low and enables Netflix to offer Australian subscriptions for around $10. This is 50% below Foxtel’s cheapest offering and, arguably, provides deeper content. Finally, Netflix’s technology is far superior. Its App works seamlessly on most devices, allows content to be downloaded offline, time stamps progress, and rarely crashes. By comparison, Foxtel’s App is clunky, regularly crashes, and cannot download content for offline viewing. Overall, Netflix represents a classic disruption of an entrenched monopoly by a new technology. Barriers to entry have been smashed and costs lowered, with consumers the ultimate winners. The best Foxtel can hope for is to stem the loss of subscribers through its sports offering. But ultimately, it can’t win against the internet. How sustainable is NFLX’s cost model is the real question. Far more so than foxtels. This is Tesla before the other car manufacturers decide to go electric. And does Netflix pay proper company tax in Australia ? Or transfer price content generated from that major movie country, the Caymans..
All these wonderful new internet disrupters are often just offshore tax avoiders (saving 30% of tax), or underpaying staff as “contractors” (like Foodaroo, Uber ). Old scams with new technology. Offering content that people want to watch that represents value for money is a good start. Foxtel: $4.00 a day for HD subscription plus $199 installation. How much sport does Netflix show these days? Cost comparisons are irrelevant otherwise. In addition: $0.50 per day currently has Netflix generating huge losses, ergo …. That makes Netflix so interesting for me! I have zero interested in sports and therefore with Netflix I don’t have to pay for it. On top of that Netflix is far better with international stuff and localisation options as it operates worldwide. E.g. try subtitles in Stan – mostly non-existent. Whale, I don’t disagree that if you are a TV show / Movie person that Fox is next to useless. There are also numerous streaming services other than NFLX. I’m not sure all will survive — at least not in their present form. It’s also ad free, which goes a hell of a long way with me. Foxtel in unwatchable due to it’s endless shyte ads. I remember when YouTube was add free. Don’t be surprised if Netflix eventually gets adds as well. My YouTube is still ad free and I’ll stop using it when I can’t cull the ads to an acceptable level. I don’t mind advertising, but as soon as it destroys the service you’re trying to use, I’m out. Pay $10 a month to get rid of ads with Youtube Red. If you’re an old Google user they also throw in an unlimited Google Music subscription. I would not be surprised to see some form of banner ads on Netflix. I doubt they will ever put full ads into the shows however. Ads on YouTube? Never heard of an adblocker? Or YouTube Premium? After one has enjoyed ad-free Netflix, FTA and Foxtel have become unbearable; why would anyone pay for content AND see ads with the same service? >But ultimately, it can’t win against the internet. That’s why Rupert lobbied hard for Malcolm to hobble NBN speeds. My feeling too, and I’d love to see someone prove it. FOI request, anyone? Yes. Absolutely a no-brainer. Ol Rup did everything possible to poison a decent NBN outcome and any Government that was attempting to provide it. The NBN we have today was failure by design. It’s a losing battle though for the likes of Foxtel. The hardware issue alone will kill them in the end. Even before the NBN started rolling out Netflix was on a winner and wiping the floor with Foxtel. Not just the content either. My mate could stream full hd Netflix on a crappy 4 Mbit ADSL 2 line. So compressed 1920x1080i guess. Foxtel internet streaming could not stream reliable at 480p. I don’t know what Netflix was doing but they crapped all over Foxtel. Yep, we have a 5Mbps ADSL and streaming works fine. Yes, have to agree. Even using basic ADSL2 and tunnelling via a VPN based server in LA, I still get HD streaming on everything on Netflix. Foxtel has nothing to compare it with. Hulu has some classic stuff. Not sure if Aussies are completely blocked from accessing it. I just looked at their TV shows alphabetically and they have All Saints on there! Home Improvement with Tim Taylor! 29 seasons of The Amazing Race! One issue that I have with Foxtel is how they change an additional fee to access most of the their Hi-Def content. Seriously? Everything on Netflix is HD, on demand and free of commercials – and as you said, it is also fast, reliable and stable. Cheaper, deeper, faster, more reliable. If it wasn’t for live sport Foxtel would already be dead. One day the sporting admins are going to wake up they are paying a lot of coin to 3rd party people like Foxtel when they could be streaming their product directly to their consumers and cut out a lot of the middle man crap. Just need a decent NBN – no wonder ol Rupert was dead set on killing it. The day that wrinkly old son of a b!tch dies I am throwing a party. My god that man is probably the worst single living human on the planet. Timmeh, I used to think that too but now I think he will simply be replaced by another right wing prick. Kim Jong-un replaced Kim Jong-il. George W. Bush replaced George H. W. Bush. James Murdoch ranted against public broadcasting recently. Would love to see Foxtel go bust. Greedy, old, self centred business model run by the privileged. All these motivations can be seen in the Netflix model too. It has, thought, liberated us from the superficiality of the short form feature film of 70-120 minutes that is incapable of reflecting complex human interactions. The widespread guzzling down of long-form series will full absorption points to new directions in filmmaking – a trend that is far from over. Why does all this ring like Taxi/Uber fable? I am always a late adopter. I still have my foxtel and will likely continue for a while. At the same time I see Foxtel are desperate to keep customers like me on board so I ring up every now and then ask a few questions and walk away with extra channels for a few months. What I need to do is look through what is available on netflix versus what I regularly consume on foxtel and do the maths. I agree sport is foxtels big weapon. I am forever turning it on and off. I had it for the super rugby until that became unwatchable. Get Netflix and Stan combined for much cheaper than Foxtel. They blow it away. Watch it though apple TV or something similar and its a breeze to deal with. I have all 3 but only have Foxtel for the sport and Game of Thrones which is pretty much done with. One of the main channels of foxtel is sky news, which the sun god wishes to be a clone of Fox News. Sky news is also being pumped into free to air win regional channel. Whether by accident, sky news has already put to air the views of Australia nazi over the weekend. Some how the decline of Foxtel and in this case sky news, maybe a blessing.